Workers in many roles may come into contact with substances or conditions that pose a risk of harm to their hands or arms. If these risks cannot be minimised in some other way, protective equipment must be used to do so. 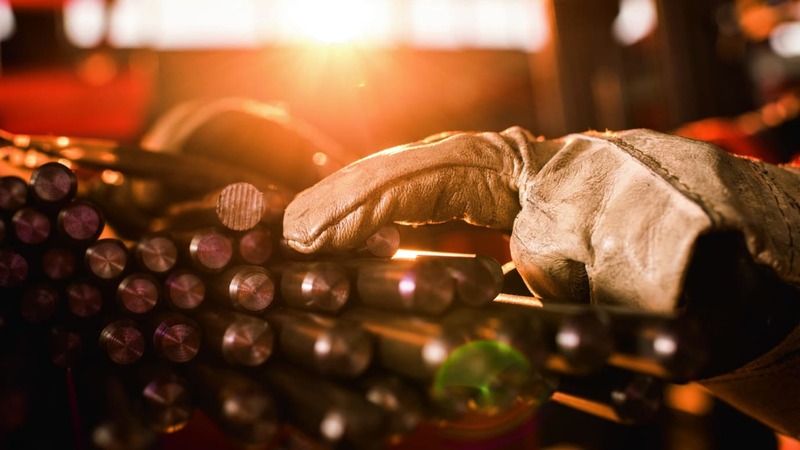 The types of hazard that may cause harm to the arms and hands include: abrasion, temperature extremes, cuts and punctures, dangerous substances such as chemicals, electric shock, skin infection, disease or contamination and vibration. The types of hand and arm protection include gloves, gauntlets, mitts, cuffs, armlets and elbow protectors. Protective equipment for the hands and arms is necessary, and employers must provide it to employees free of charge, while self-employed people are required to obtain it themselves. Generally, risk assessment should be executed in the workplace. After identifying and evaluating the presence of specific hand and arm risk related to the workplace, the required arm and hand protection must then be selected. Selection of the right type of glove is essential in protecting users from hazards that they may encounter during their work. These include chemicals, biological hazards, heat, extreme cold, abrasive surfaces and mechanical hazards. Gloves can protect against chemical exposure, infections, burns, cuts and damage to the skin. To ensure the most appropriate gloves are provided for the task and the environmental conditions, it is necessary to identify the hazards and the need for protection. This identification should include a list of the chemicals involved as well as physical hazards such as abrasion, tearing, puncture, fire/flames, temperature, and/or biological hazards. The kind of hazards present will also affect the decision to use other protective clothing in addition to gloves. Always check the Safety Data Sheet (SDS) and other sources for information about hazards. 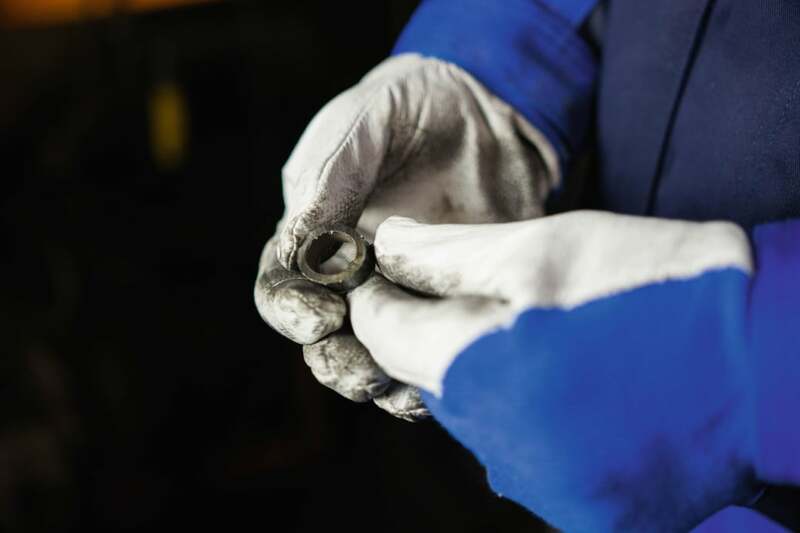 Identify the manual dexterity required: thicker gloves provide greater resistance to chemicals and mechanical damage, but thick gloves can also impair grip and dexterity and could compromise safety. Select a suitable material to give the protection required. Materials should be selected based on quantitative information such as permeation rate, breakthrough time, penetration and degradation, and any other considerations such as temperature and grip requirements. 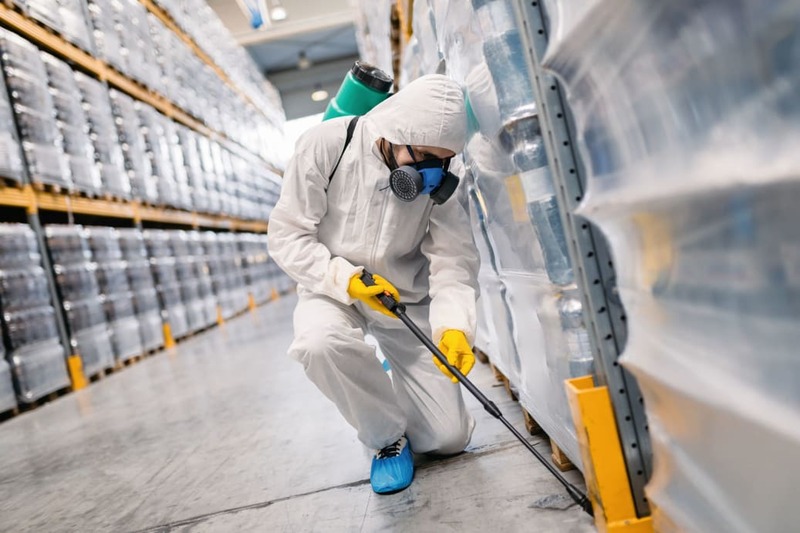 For example, if you are using a number of different chemicals you will need to select gloves that will give the greatest level of protection from the hazards that are associated with all of the chemicals being used. You may need to consider using two different types of glove material to offer the greatest protection against the hazards. Ensure there will be no adverse effects from the selection as a result of style, fit or material; for example, latex gloves can cause allergic reactions in some users and other alternative materials should be considered. Determine the potential effects of skin exposure: When using chemicals the immediate irritation or corrosion of the skin must be considered in addition to the potential health effects to the entire body from absorbing the chemical through the skin. Consider the workplace conditions such as temperature and the need to perform repetitive movements: Exposure to sweat inside gloves can cause dermatitis and other skin conditions. If repetitive tasks are being performed, such as pipetting, select gloves that are flexible and elastic. Also consider the duration and nature of contact; tasks that require hands to be immersed in liquids will need a higher level of protection than ones where only splash protection is required and tasks where the user is exposed to extreme temperatures will also need a higher level of protection. Also consider how long persons will be in contact with the hazards (e.g. occasional contact or continuous immersion of hands or continual contact). Consider cuff length: Some hazards will require a longer cuff length to protect the both the hand and forearm and to prevent liquids seeping into gloves. A longer cuff length needs to be considered if large volumes are being used or if hands are required to be immersed in liquids. Determine whether re-usable or disposable gloves are required: thicker reusable gloves may be required as single use gloves do not offer a high degree of protection against abrasion, puncture, snag, tears and some types of highly toxic or corrosive chemicals. Natural rubber (latex) gloves can be used to protect biological hazards as they have excellent tensile strength and elasticity, but it may cause allergic reactions for some personnel. Butyl Peroxide gloves resist strong acids and bases, alcohols, aldehyde, ketones, and esters. They protect against a wide variety of chemicals, but will not give complete protection with aliphatic and aromatic hydrocarbons and halogenated solvents. A neoprene glove gives good protection against alcohols, oxidising acids, hydraulic fluids, phenol, glycol ethers. It has good pliability, finger dexterity, high density and tear resistance, but would not perform well with halogenated and aromatic hydrocarbons. Nitrile gloves are good for oils, greases, aliphatic chemicals, xylene, alcohols, acids and caustics as they have good dexterity and sensitivity but poor against strong oxidising agents, benzene, methylene chloride, phenol, ketones, acetates and aromatic solvents. Polyvinyl chloride (PVC) will give protection against strong acids and bases, salts, and other water solutions. It can be used for immersion as they have less dexterity and sensitivity. Cryogenic gloves protect against tissue damage from cryogens or very cold containers and equipment. Leather gloves can be used for welding, sheet metal work, handling hot or cold objects, gardening. It provides protection against heat, cold, sparks and cuts, they come in a wide variety of styles and fit. But they are not good for working with liquids and when wet will offer poor protection against heat and cold. Mesh gloves can be used for work that requires repeated cutting and slicing which protects against cutting and slicing, but steel mesh gloves can be heavy and impede movement. Aluminised gloves are helpful for furnace work, handling hot objects. They provide good protection against heat, but are not to be used for electrical work. Cotton can be used for general duty work having moderate resistance to heat and cold. A standard is a document that provides rules, guidelines or characteristics for activities or their results, for common and repeated use. Standards are created by bringing together all interested parties including manufacturers, users, consumers and regulators of a particular material, product, process or service. Everyone benefits from standardisation through increased product safety and quality as well as lower transaction costs and prices. Each European Standard is identified by a unique reference code which contains the letters 'EN'. As per EN standards, protective gloves can be divided into three categories depending on type and which risk or danger the gloves should protect against. Gloves of simple design, for minimal risks only. Examples of gloves in this category are household gloves used for cleaning and for protection against warm objects or temperatures not exceeding +50°C. Additional gloves in this category can include light-duty gloves for gardening or other work where the risk for injury is minimal. Gloves of intermediate design, for intermediate risks. Gloves are placed in this category when the risk is not classified as minimal or irreversible. The gloves must be subjected to independent testing and certification by a Notified Body, whom then issues a CE marking showing the gloves’ protective capacities. In this category you will find general handling gloves requiring good puncture and abrasion performance according to EN 388. Gloves of complex design, for irreversible or mortal risks. Gloves in this category are designed to protect against the highest levels of risk, e.g. highly corrosive acids. Gloves in this category must also be independently tested and certified by a Notified Body. EN 420 Protective gloves in terms of construction, fitness of purpose, safety, etc. The gloves must have been made so as to provide the protection they are intended for. The seams and edges must not cause harm to the user. The gloves must be easy to put on and take off and the material must not harm the user. The pH of the gloves should be between 3.5 and 9.5 and the Chromium (VI) content should be below 3 mg/kg in leather gloves. The manufacturer must state whether the glove contains substances that may cause allergies. The protective quality of the glove must not be affected if the washing instructions are followed. The gloves must also allow maximum finger mobility (dexterity), given the need for protection. It is important to choose the right glove size as using gloves that are too large may increase the risk of an accident occurring. The sizing system in the below table is based on hand size, i.e. circumference and length. The standard also specifies requirements for resistance to water penetration, which is measured where necessary. The subsequent instructions should be included with the gloves’ packaging. It should contain the name and address of the manufacturer or representative with the glove and size designation. It has to give reference to the standard that the glove has been tested against with an explanation of the pictogram (gloves category) and the mark. It should give information on substances in the glove that may cause allergies with storage instructions. Detailed guidance on disposal of the glove after use and the limitations of use. The instructions must contain warnings concerning any mechanical or thermal risks and/or chemical health hazards. For chemical gloves, information should be given on which chemicals have been tested and up to which level. Safety gloves are used to prevent hand lacerations, abrasions and chemical exposure, which are some of the most common injuries in many work environments. A number of quality factors should be considered while selecting safety gloves. An unlined glove can be very difficult to get on and off because the skin on the hand and the leather inside want to stick to each other. So always look for lined gloves. Linings add thickness to the gloves, which makes it easier to get them on and off. They are also needed for insulation for warmth and cut resistance. Low quality leather gloves are coloured differently than better quality leather gloves. The colouring covers imperfections and blemishes in the leather. The downside is that it makes the leather less able to stretch. That is why cheaper leather gloves easily develop cracks and fissures. The best leather for a glove is made from sheepskin and is very soft yet also very strong and durable, too. Quality of the glove can be tested by holding the bowl of the spoon between the thumb and forefinger of your gloved hand. Slowly try to pull the spoon from the grasp of the thumb and forefinger. If the glove is made using genuine leather it will grip the spoon and will keep it from slipping. If it is low-quality leather, the spoon will slip from the hand easily. The best way to test thermal hazard protective gloves is to hold the gloves near the gas flame on the material for 15 seconds. After the flame is extinguished the length of time is measured for how long the fabric burns or glows. It will then be scored on a 1-6 scale with higher numbers referring to better test results. Special gloves are required to protect the workers from electrical risk. Gloves that are manufactured and approved according to EN standard 60903 are the only gloves that should be used when there is a risk for electrical shock. To help in the decision as to which glove provides the best protection, it is important to know which voltage level can occur. Refer to the table below for a summary of which glove classes tolerate different voltage levels. To protect the electrical protection gloves against wear and tear, for example from sharp cables, a specially designed protective glove can be worn over the electrical gloves. As per EN 407 standard, the performance of thermal protecting gloves can be evaluated with the below methods, then a rating will be provided which varies from 1 to 4. The higher the number, the better the test result. To check the resistance to flammability and heat, the glove’s material is stretched and lit with a gas flame. The flame is held against the material for 15 seconds. After the gas flame is extinguished, the length of time is measured for how long the material either glows or burns. To assess the heat resistance, the glove’s material is exposed to temperatures between 100°C and 500°C. The length of time is then measured for how long it takes the material on the inside of the glove to increase by 10°C from the starting temperature (approx. 25°C). Fifteen seconds is the minimum accepted length of time for approval. For example: to be marked as Class 2, the glove’s inside material must manage 250°C heat for 15 seconds before the material exceeds 35°C. The convective heat resistance is measured for the heat from a gas flame (80Kw/ kvm) to increase the temperature of the glove’s inside material by 24°C. Resistance to radiant heat can be found by stretching the material in front of a heat source with an effect of 20-40 kw/kvm. The average time is measured for heat penetration of 2.5 kw/kvm. 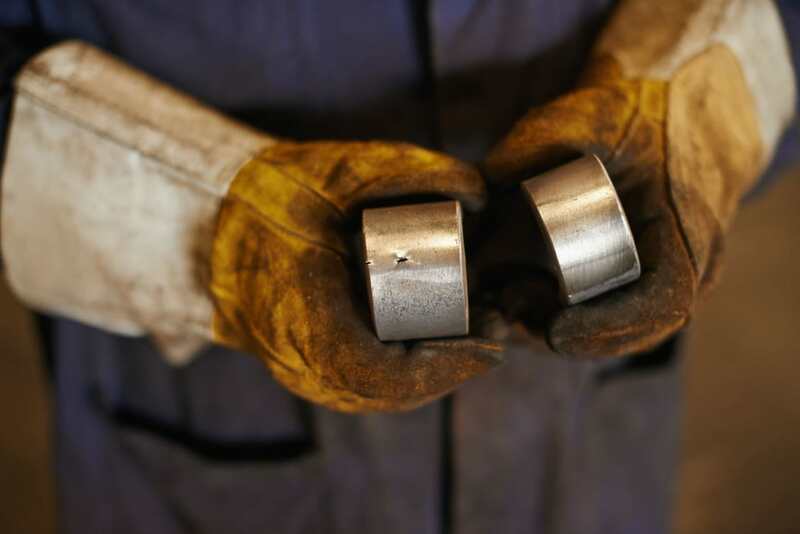 Resistance to small splashes of molten metal can be tested based on the total number of drops of molten metal required to increase the temperature by 40°C between the inside of the glove and the skin. 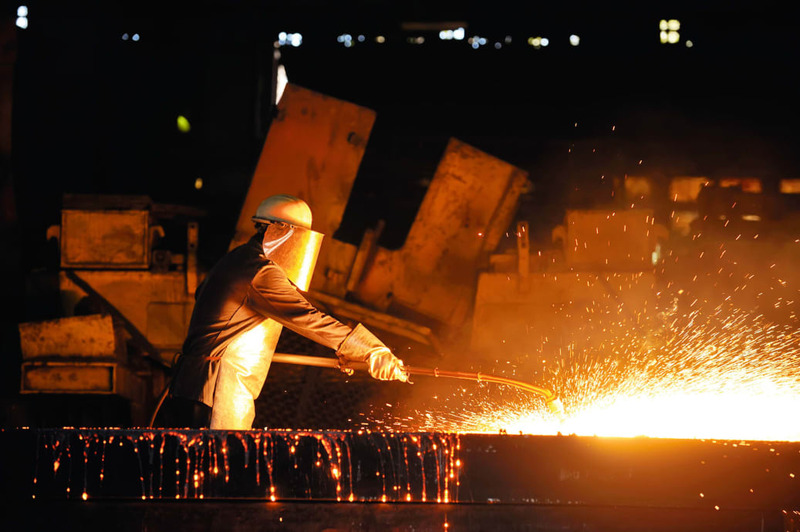 Similarly, the resistance to large splashes of molten metal can be tested using simulated skin which is attached to the inside of the glove material. Molten metal is then poured over the glove material. The total number of grams is measured of how much molten metal is required to damage the simulated skin. As per EN 388 protective gloves level against mechanical hazards is expressed by the following test performance. The resistance to abrasion is based on the number of cycles required to abrade through the sample glove (abrasion by sandpaper under a stipulated pressure). The blade cut resistance is based on the number of cycles required to cut through the sample at a constant speed. The tear resistance is based on the amount of force required to tear the sample. Puncture resistance is determined by the amount of force required to pierce the sample with a standard sized point. For all the above tests, protection factor is indicated on a scale from 1 to 4 depending on how many revolutions are required to make a hole in the material. The higher the number, the better the glove. As per the European Working Conditions Survey and HSE statistics report, hand accidents are an occupational hazard in many industries, with up to 40% of all workplace accidents involving hands to some degree. Of these accidents, 24% are related to handling related injuries with an average of 6.6 working days lost due to hand injuries. Nine percent of the UK population is affected by dermatitis and a two million strong work force is at risk from hand arm vibration. So hand injuries are not just painful, they’re expensive too. It becomes a crucial decision for employers and HSE Professionals in identifying, selecting and more importantly providing effective hand and arm protection to all their employees. The above discussed concepts will help us to understand the importance of safety gloves as well as the legal standards and quality requirements of the PPE, which will guide us to select quality hand and arm protection for the work force.